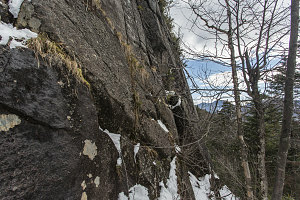 This trip report describes a late-fall outing to the top of Yard Mountain - one of the Adirondack's rarely-visited higher peaks. 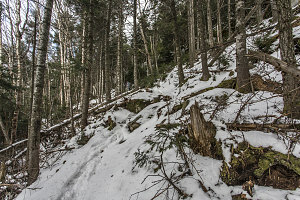 Along with Yard, we continued on, describing a loop route over Big Slide and returning over the very scenic Brothers. It had been just over a month since we had returned from our logistically-challenging but ultimately very successful 2013 outing to Utah. 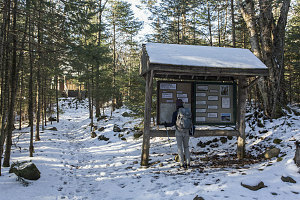 That was simply too long to be away from hiking, and Jenn was clamoring for something - something in the Adirondacks (our last ADK outing had been way back in August with Julie and Ty). 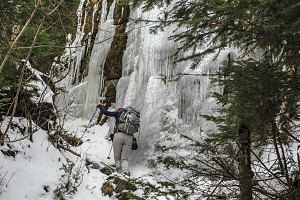 Jenn ended up choosing a peak - a 4000-footer peak - that she had never done before. Now, the astute among you may wonder how that is, given that Jenn has already completed her ADK-46. 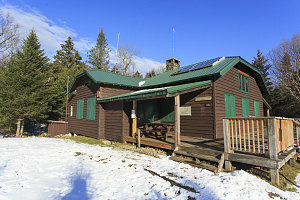 The reason is that Yard is one of two Adirondack 4000+ footers that never made it onto that original 46R list. More about that later. First, let's get started describing this hike. 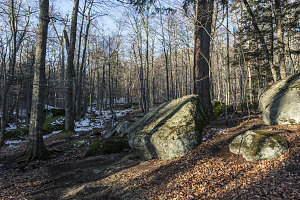 We had been patiently waiting for a nice sunny day to coincide with the weekend, and after a long stretch of dreary weather, it finally it did - on November 16. We arrived at The Garden parking lot bright and early - around 7:30am. Very few cars. As I mentioned earlier, we were doing this outing as a loop hike. 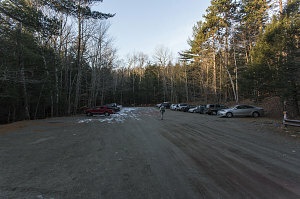 We decided to do the hike in the clockwise direction: that is, head up Johns Brook Valley, then ascend Yard Mountain, then return via the tops of Big Slide and The Brothers, finally arriving directly back at The Garden parking lot. 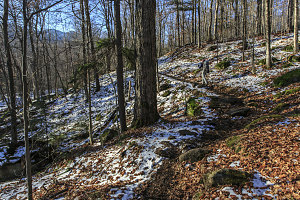 We started off, marching briskly along the main trail that leads up along the bottom of Johns Brook Valley. As we had been driving in, we noticed the white of snow dusting the tops of peaks. 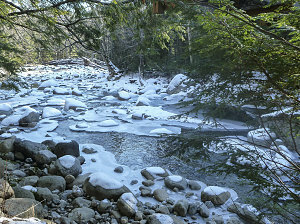 Down here, though, along the lower reaches of the main trail leading up Johns Brook Valley, it was almost entirely snow-free. A warm morning sun shining in from the side created a nice "warm fall day" sort of vibe. 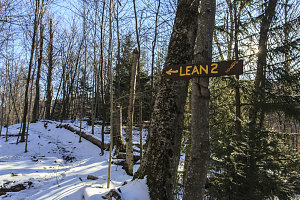 As we proceeded along, I noticed that there had been changes to the Lean-to situation in the valley. 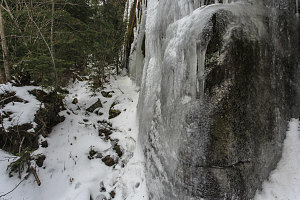 Some lean-tos had been entirely removed, and others were now re-positioned out of view, away from the trail's edge. The easy-to-follow trail rose ever-so-gently as it headed up-valley. 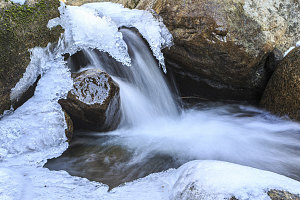 And, as it did so, we gradually started to see bits of snow - first as a trace here or there, but then in larger patches, and with greater depth. 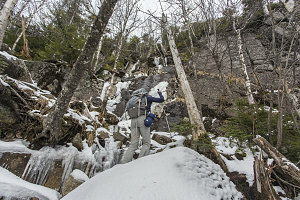 By the time we reached the Howard Lean-to, not far from Johns Brook Lodge, the snow cover was almost continuous. 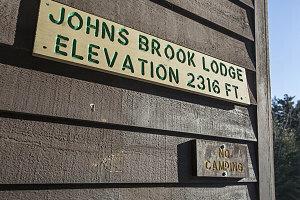 Our brisk march brought us to the sunny porch of Johns Brook Lodge at about twenty minutes past 9am - about an hour and a half after leaving the trailhead. We had a brief food break here. 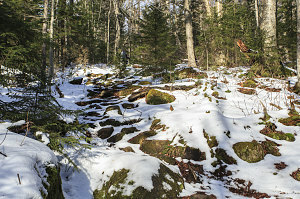 From Johns Brook Lodge, we started our ascent towards Yard Mountain. 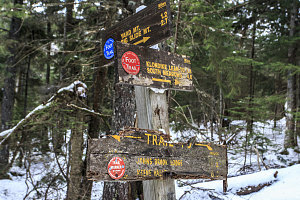 The route first follows the Klondike trail, a very rarely used route that connects Johns Brook Valley with the South Meadows area near Adirondak Loj. 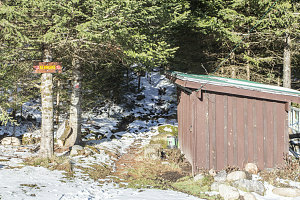 The terminus of the Klondike trail is in a slightly obscure location, tucked away next to a shed behind Johns Brook Lodge. 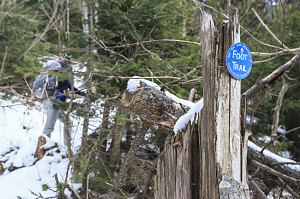 The Klondike trail was quite easy to follow, because - surprisingly - there was a set of tracks in the snow. 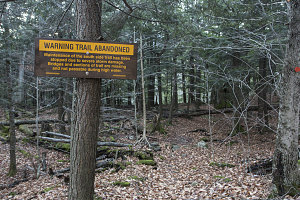 I had not expected to see recent activity along this trail. 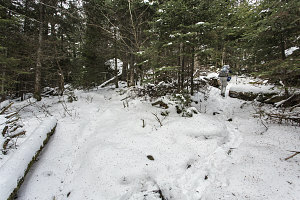 The Klondike trail ascended about 700 feet, at which point we reached a junction with the trail coming down from Yard. The originators of the footprints we had been following had climbed Yard, since at the junction the prints went up in that direction. 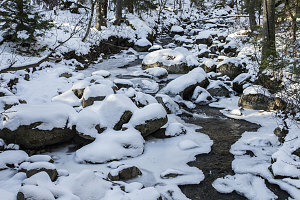 Now at the 3000-foot level, there was a continuous carpet of snow covering everything - perhaps a couple of inches or so. A bank of clouds overhead had turned the weather somewhat overcast and cool. The sense of a dry and sunny fall day, which we had been enjoying earlier, had entirely disappeared. 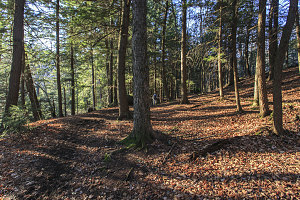 The trail led upwards, traversing diagonally first right, then left, then right again, as it sought out weaknesses in Yard Mountain's cliffy southern slopes. 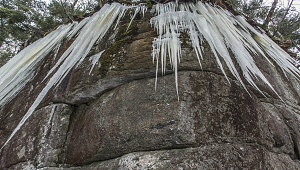 The cliffy slopes resulted in a lot of pretty ice formations. Although we had them with us, we did not yet don our microspikes. 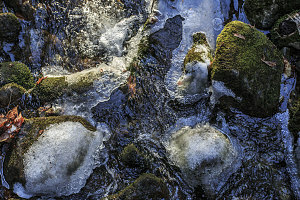 There was surprisingly little ice directly underfoot - just a few inches of wet snow over ground.